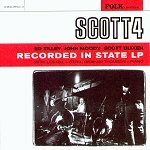 A London-based three-piece, Scott4 combine everything from rock 'n' roll, folk, pop, and country to backbeats to create a pretty distinctive sound that is sure to catch your attention on the sheer fact that it offers up something different than the norm. I'll be truthful, the first time I heard this album I hated it. It was very different, yet similar, to some of the stuff I was listening to at the time, but for some reason it didn't click with me. I shelved it for a bit, but upon reviewing it I wanted to give myself a refresher course. So I picked it up and tried my darnest to find something I liked about it. Of course, this time I started to find a lot of stuff I liked about it. From the backbeat of "Deutsche LP Record" to the soft, quiet whistle of "Your Kingdom to Dust," it finally dawned on me that this was something pretty potent and unique. So I kept listening to it, absorbing it all. The album kept repeating itself, but in different variations. It would turn up the distortion on the guitar and offer up some rock beats one minute, and then the next minute it would get subtly quiet. They they'd pick everything back up with some bubbling backbeats. Repeating this a few times, they began to play with my mind. And I liked it. After all was said and done, I really started to enjoy the album's flavor. Check it out. It may take some time, but the time it takes is worth it. I'll give it a B+.